Aquila in the New World (Aquiliad, No. 1)On this alternate Earth, Rome rules all . . . including the New World, known in other dimensions as America but here as Terra Novo. General Titus Papinianus is governor of that untamed land, and Aquila, chief of the savage Lacoti nation, is a Roman senator. But official titles aside, their duty is to Caesar. So when Caesar sends them on a quest for the fabled land of China, thought to be somewhere in Terra Novo, off they go. They are hardly prepared for bloodthirsty Aztecs, flying machines, time-traveling aliens, or Bigfootand Aquila's problem-solving strategies are unconventional to say the least! Before they know it, their adventures lead them into the hands of the Time Criminal, who is bent on altering all the multiple universes to suit his own evil whims. Somehow they have to stop him . 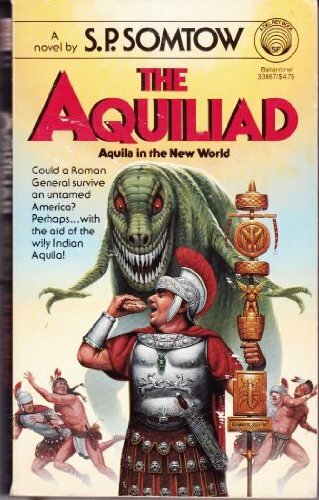 . . before their world is destroyed!Some readers' reviews on Goodreads:This science fiction novel about an alternative history where Rome has conquered the entire Earth is disjointed, rambling, and not very funny. I think this is supposed to be humor. It's hard to tell. I don't want to give away too much, so I will only mention things the teaser material hints at: Aztecs, flying saucers, a Roman general's hunt for China (by crossing North America), flying saucers, Sasquatch, time-traveling aliens, Lacota Indians, etc. The Romans have cars. They cross the Atlantic like it's no big deal. It certainly isn't the best book I've ever read, but it was highly amusing and well worth a read if you find it for a buck or two at your local used book store. This Sucharitkul doofus has decided that because he knows five or six Latin words and has read Decline and Fall of the Roman Empire: The Cliffs Notes Version a couple times, he is an expert on ancient Rome, and furthermore, since he is a person, he is an expert on human psychology. Combining these two, he is an expert on psychohistory on the level of Hari Seldon. Therefore, he is better suited than anyone else to write an “epic” examining what would have happened had Rome not fallen. Let's start with the setup. The story takes place around AD 100, which we know because the sequence of Roman emperors hasn't changed. Indeed, Domitian (AD 81-96) and Trajan (AD 98-117) are supporting characters. The Romans have exactly three new inventions, I believe: steamships, steam-cars, and bicycles. The book eventually explains where these things came from, starting with a lone scientist working in secrecy. And why no other inventions have come from the same source. But the book fails on other questions. Why haven't the Romans reverse-engineered the steam engine and used it in other capacities? It's not as if steam turning, say, a paddle wheel is anything complex? So why haven't these inventions transformed Roman society? It's not clear how long the inventions have been around. I think it's only a century or two. Any longer and they would've caused this world's history to diverge radically from our own. On the plus side, the Native characters--especially Aquila and Hooting-Owl--are well-realized. As well-realized as any "Old World" characters, anyway. Even if they have "comical" names such as Equus Insanus (Crazy Horse), who isn't due to be born for another 1700 years. These characters are relatively free of stereotypes. They don't talk or act like savages. Indeed, Aquila has a realistic capacity to roll with the punches and change with the times. He eventually becomes a respected Roman senator who wears a toga. Alas, there's much more on the minus side. The Romans have conquered the eastern part of North America. Their colonies are similar to what the US had in the early 1800s. Full control of the eastern seaboard, small towns along the Mississippi, nothing but a couple of forts further west. But having steamships wouldn't have helped the invading armies. Without gunpowder or mounted troops, the Indians' superior numbers would've been telling. Even with the advantage of disease, I don't think the Romans could've won. If they did win, it might've taken them twice as long--600 rather than 300 years--to "tame the wilderness." Rome came into existence only 850 years earlier. Could Romans conquer the same lands in Europe and Asia, plus another half a continent across an ocean, in the same amount of time? I don't think so. I don't know if Somtow read the Cliff Notes version of Roman history, but he probably read the Cliff Notes version of Native history. He set up his alternate US to resemble the well-known, "Wild West" version of Native America. Iroquois in the northeast; Cherokee, Creek, and Seminole in the southeast; Lakota on the northern plains; Comanche, Apache, and Caddo on the southern plains; Chinook, Kwakiutl, and Tlingit in the northwest. He even gave the tribes "clever" Latinized versions of their names--e.g., Apaxae for Apache. But this isn't how it was in AD 100. The Siouan tribes (e.g., Lakota) were still in the Carolinas, I believe. The Athabascan tribes (e.g., Apache) were still in the far north. The Seminole tribes didn't exist since they came together only in the 1800s. And these tribes had their own names for themselves, in their own languages. The "Iroquois" were the Haudenosaunee. The "Cherokee" were the Tsalagi, and so forth. Giving us Latinized versions of names that didn't exist is a silly mistake. Mound BuildersThe varying cultures collectively called Mound Builders were inhabitants of North America who, during a 5,000-year period, constructed various styles of earthen mounds for religious and ceremonial, burial, and elite residential purposes. These included the Pre-Columbian cultures of the Archaic period; Woodland period (Adena and Hopewell cultures); and Mississippian period; dating from roughly 3500 BCE to the 16th century CE, and living in regions of the Great Lakes, the Ohio River Valley, and the Mississippi River valley and its tributary waters. Beginning with the construction of Watson Brake about 3500 BCE in present-day Louisiana, nomadic indigenous peoples started building earthwork mounds in North America nearly 1,000 years before the pyramids were constructed in Egypt.None of this is evident in Aquila in the New World, but it's fundamental. Great mound-building civilizations dominated America during the Roman era, but Somtow somehow missed it. The one thing Somtow almost got right is having the Olmecs--not the Aztecs, as one reviewer said--rule in Mexico. Actually, the Olmec civilization had collapsed and the Classic Maya civilization had yet to rise in AD 100, but close enough. With a little help, the Olmecs might've lasted longer. The Olmecs have more inventions than the Romans, including hot-air balloons, elevators, and loudspeakers. Unfortunately, it's not because they're cleverer than the Romans. Rather, an alien in the form of a were-jaguar, a revered Olmec figure, gave the Indians these gifts. I don't know if Somtow intended this, but he basically replicated the "ancient astronauts" theory of Erich von Däniken. Namely, that non-European civilizations arose only because aliens disguised as gods gave them knowledge and technology. That they weren't smart enough to build pyramids and other monumental structures on their own. True, the aliens also helped the Romans, but to a much lesser degree. Yet the Romans have conquered half the world, while the Olmecs are still in Mexico. The implication is that the Romans were smart enough to use their gifts properly, while the Olmecs squandered them on a despotic kingdom ruled by superstition and sacrifice. In short, the Europeans were rational and the Indians weren't. Aquila in the New World has more Native problems, but these are some of the main points. It's not badly written if you go paragraph by paragraph. But its historical aspects are flawed and its "satire" fails as much as it succeeds. Most of all, its premise--a mishmash of concepts embodied in the phrase "flying saucers, Sasquatch, time-traveling aliens"--is unbelievable and uninteresting. It's like a child's version of science fiction--like something you'd read in a bad comic book. Like Superman goes back in time and the ignorant savages worship him as a god--that kind of bad. I expected more than this. If you're going to give us an alternate history, I expect some semblance of accuracy. If the South won the Civil War or the British Empire never fell, tell us how and make it plausible. All in all, I'd recommend skipping this book. Rob's rating: 6.5 of 10.